Let’s face it – recession or not, the economy is tough. Every promotional dollar you spend needs to be for a campaign that is highly targeted and effective. Did you know that there’s no better investment than an imprinted product when it comes to Return on Investment (ROI)? Three-quarters of the recipients could recall the advertiser’s name that gave them the imprinted product. In comparison, only 53% of the same group could recall the name of a single advertiser they’d seen in a magazine or newspaper. Next, here are a few examples of products that provide a “recall punch” without heavy price tags. 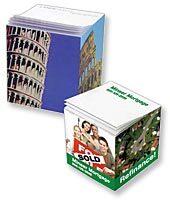 Imprinted sticky notepads are handy little brand-messengers that make cost-per-impression (CPI) negligible. First, you’ve got the multiple times daily that the recipient views the notepad on his/her desk. We’ll conservatively estimate three “exposures.” If that person writes three notes and distributes them to three colleagues, you’ve doubled the number of exposures. Begin dividing the cost of a $1.50 notepad of 100 sheets with the number of impressions achieved and you’ll see that the CPI is a fraction of a cent. 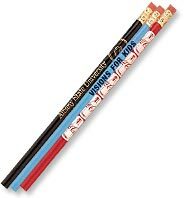 Here’s another favorite penny-pincher: pencils. The average pencil can write 45,000 words. Each moment your recipient writes a word is an impression, as well as the time spent subconsciously seeing that logoed pencil in the caddy on a desk. The mileage you get for the few cents you spend per pencil is mind-boggling. A USB keytag is also a guaranteed winner. 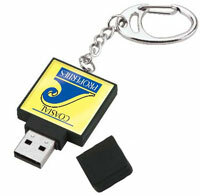 These computer accessories allow you to upload a marketing presentation and put it in the hands of your target audience. They can then use the device to store digital artwork and photos, PowerPoint Presentations, Video Demos and more. We live for this sort of trivia because it tells us the best way to make your promotional dollars go further! Give us a call at 708-478-8222, send us an e-mail or visit us online at www.linjen.com and we can begin searching for the most economical and effective products for your budget and goals.